In the previous blog, we discussed how knowing the colour psychology aids in setting a style to your décor. Here are more colours you can choose from to set the right mood in your space. Meaning: Purple has been associated to royalty or as the colour of kings. It symbolizes power, nobility, luxury, and ambition. It is related to wisdom, dignity, independence, creativity, mystery, and magic. Mood: Purple is uplifting, calms your mind and nerves. It offers a sense of spirituality and wisdom, encourages creativity and success. How to use purple in your Interior: purple can add exotic flair to your space or a layer of mystery to your design by using it in your furniture, accessories or wall paint. If you’re having a purple sofa or couch, make sure it is blended with a wall paint that is in light colours such as light pink, light grey or white. Depending on the tone or shade, purple can be dramatic or quiet. The regal colour can add richness to a space or drama to an architecturally simple room. 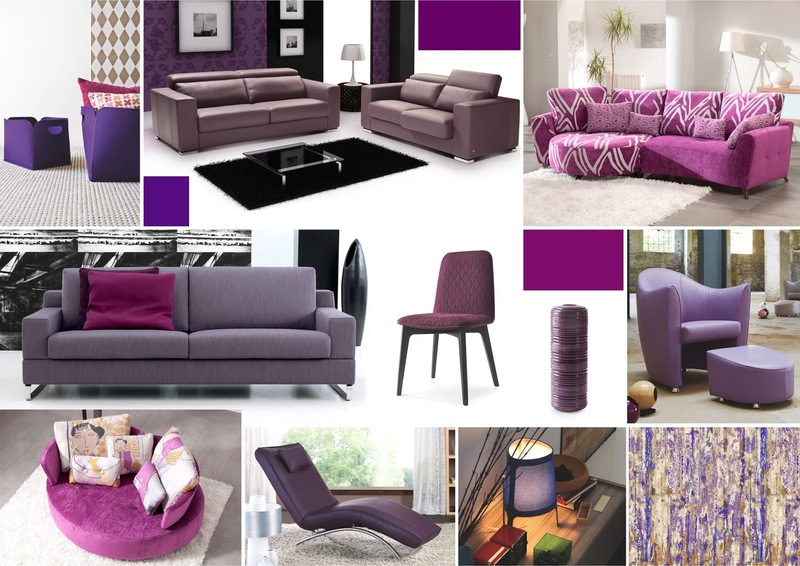 Purple colours range from light lavenders to solid plums, and a few tactically placed purple accents may be all you need to create a whole new vibe for your space. Light lavender-gray can add softness to a formal living room. Make a room lively by pairing mid-tone purple with mustard yellows. If you want something more lush and sophisticated, use eggplant purple in your decor paired with high-gloss white trim. Purples combined with soft blues or greens create a very tranquil colour scheme. A dark, rich purple can provide a lovely backdrop to show off fine crystal-wares and antique silver. Use purple accessories to brighten up and add depth to a neutral colour scheme. Warm purples can make your room feel cosy. If you really want some purple in your home, try blending it with more natural colours like subtle yellows or greens. Meaning: this colour is associated with power, elegance, formality, and mystery. Though it has many negative connotations, this colour can be used intelligently in your décor to make your space look great. Black denotes strength and authority; it is considered to be a very formal and a prestigious colour. Mood: this colour is highly sophisticated and can be timeless and classy. Black gives you a feeling of inconspicuous, restful emptiness, mysterious evoking a sense of potential and possibility. How to use black in your Interior: Black gives the feeling of perspective and depth. It is ideal to highlight certain things in a room. Black contrasts well with bright colours. Combined with red or orange – other very powerful colours – black gives a very aggressive colour scheme. The only problem with black is that it gives the illusion of tight space. Dark colours generally make rooms seem much smaller than they are, hence it might not be a great choice for background colour especially on walls. Use of orange and black tend to give a holiday look to your space but some new colours can be pulled in to give a fresh look in and out. One current trend is mixing a neutral room colour with some pieces of black furniture. Using a black sofa, or lamps can give an effect of elegant, as well as provides a contemporary twist for a traditional room. Black used with a mix of white and bright colours often looks very modern. If it is put on a light or neutral background colour, everything which is black will stand out. Use psychological effects of black colour to create an elegant and bold aspect for your home. 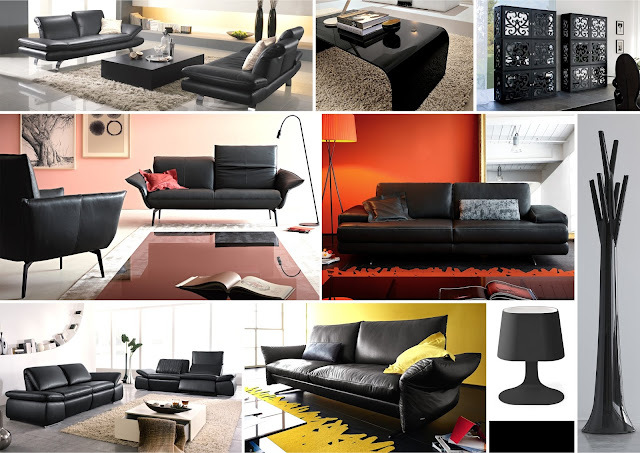 If you use it in a smart way, black gives an elegant and sophisticated air to interior design. Meaning: Grey is a cool, neutral, and balanced colour. It is also associated with formal, conservative, and sophisticated. Grey is elegant, conventional, dependable and practical. It is a colour of maturity and responsibility. Mood: Being both still and emotionless, grey is strong and steady, giving a feeling of cool and self- restraint. It gives an impression of exquisite and formal. Grey emphasizes the will to obey, create expectations, reduces energy from other colours and provides a sense of isolation and alienation. 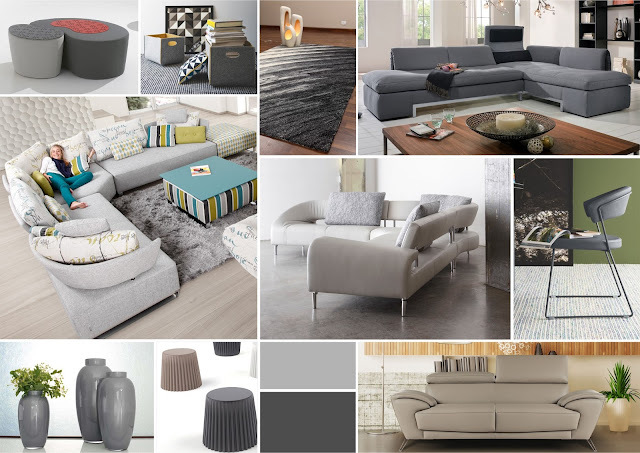 How to use grey in your interior: it has an ability to enhance creativity. Grey is favoured as an executive colour. As a neutral, grey provides an unobtrusive background for an infinite number of colour combinations. Greys on walls are often very liveable for a long while, provide a flexible neutral background for furnishings, and can be extremely stylish. Do not overly use the colour; instead divide the proportion in your furniture, paint or accessories. Grey interior gives a formality that is subtle elegance without being too conservative. It can create a clean, calm, sophistication and refreshing appearance. If you long for serenity, using the colour grey in your home decor is a great start. You can choose a solid grey that symbolizes strength, or go for a softer grey that offers a more delicate feel. A favourite neutral of designers, many use it as a background colour, or mix different tones and shades of grey together to create a feel of simple glamour. Grey can also soften a loud sofa or provide the perfect backdrop that allows wood accents to shine. Grey can also be calming–a perfect hue for uniting a range of decor choices in large and small spaces alike. Meaning: it means down to earth, reliability, elegance, security, stability, warmth, and honesty, is a natural, neutral colour. It also represents steadfastness, simplicity, friendliness, dependability, and health. Colour of the earth, it is comforting and nurturing. Mood: It induces a feeling of naturalness and comfort to your home. It gives a feeling of wholesomeness and practicality, stability and reliability, grounded with a connection to earth and offers a sense of orderliness. 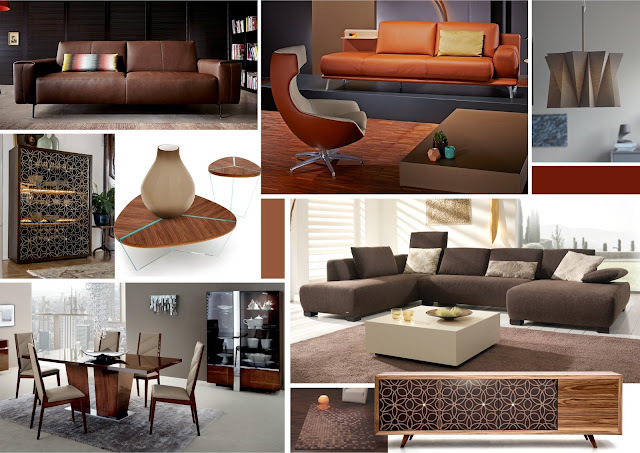 How to use brown in your interior: In interior arrangements, brown can add depth and warmth. In the neutral colour schemes you can add a bit of brown to make them look inviting. Furniture finishes and a beautiful parquet floor or natural colours can be very fine and add good taste. Or, if you use unpolished wood or wool textiles in natural shades of brown create a pleasant rustic effect. A brown sofa is also a good deal in your space that gives it both classic and contemporary look. Brown makes you slow down and relax. Use brown to highlight stronger colours like lime green or orange, or to tone down a room. Brown gives you an earthy richness that makes a room feel warm and inviting. Brown comes in many different tones and shades, contrasting light and dark, and offers the kind of variety you need for both the interior and exterior of your home. Mix things up by painting your walls a rich chocolate brown to create a sophisticated backdrop for neutral accessories. Brown can be paired with burgundy for a swank dining or living room, or used with pale aqua to create a lighter and airy feel. Mixing cool blue with dark brown evokes the feel of the earth and sky. Combine a masculine brown with a feminine colour, like a light purple, to add softness in a space. If you love the look of wood or leather or already incorporate this earthy natural look in any room of your house, adding some brown paint can amplify the look. Meaning: White is associated with light, goodness, innocence, purity, and virginity. It is considered to be the colour of perfection. White means safety, purity, and cleanliness. It has a positive connotation and can represent a successful beginning. Mood: It aids mental clarity, encourages us to clear clutter or obstacles, evokes purification of thoughts or actions and enables fresh beginnings. How to use white in your interior: Use the psychological effects of colour of white to create a refreshing and clean look in your home. People associate different things with white. White is used to create an airy appearance, quiet and pure. If in a room is used on walls, furniture or floor, white may give the impression that it is much higher than it is and can give an invigorating freshness. If you don’t want to have very colourful room but no excess white, you can use white in combination with other neutral colours. Black, brown or gray with white fit very well. Debunk the thought that whites don't count as a palette. Different shades of white make a soothing living space and can enhance architectural details. 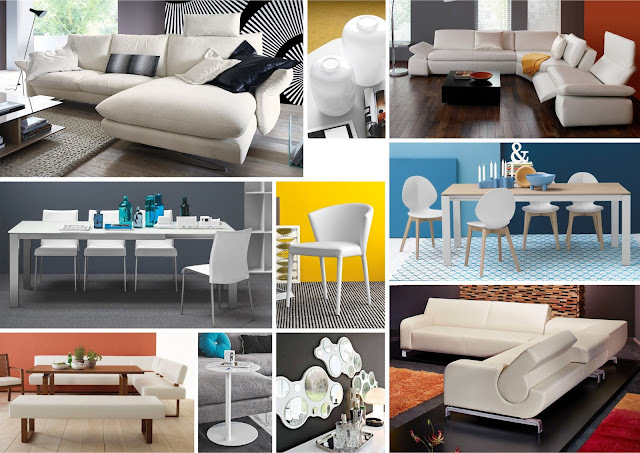 If you enjoy a constantly changing environment, then white might be your colour. Colour can be brought in with flowers and seasonal changes on pillow fabrics. Meaning: Oranges are warm, welcoming, and vital. Melon, tangerine, and yellow-orange mango are bright, cheerful, and tend to improve appetite. Orange combines the energy of red and the happiness of yellow. It is associated with joy, sunshine, and the tropics. Orange represents enthusiasm, fascination, happiness, creativity, determination, attraction, success, encouragement, and stimulation. Mood: It can stimulate feelings relating to summer, stimulate hunger and enthusiasm, relates to meditation and higher self and Creativity. 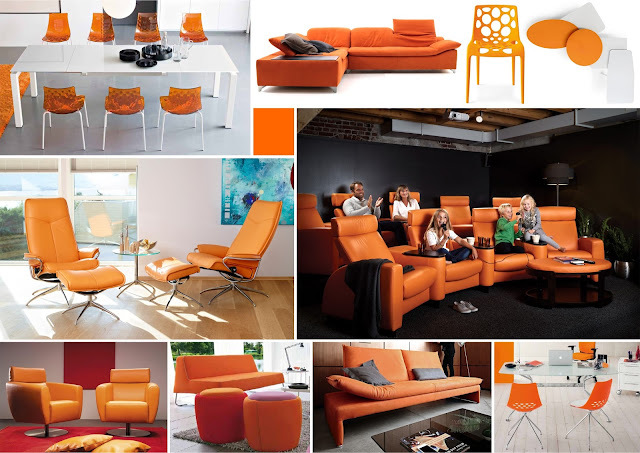 How to use orange in your interior: If your home needs a jolt of energy, orange might be what you need. Orange conjures images of citrus fruit or a summer sunset, and represents happiness and innovation. Orange has a reputation for being overwhelming, but variations like apricot and terra cotta can inspire relaxation. A deep orange can feel bold during the day but cosy and warm at night. Orange has steadily progressed up the ladder of consumer preferences so there's a greater appreciation of the colour; Orange is the child of red and yellow. It gives you the excitement of red, but at the same time, the welcoming, friendly, warm aspect of yellow. You can use a pale, dusty orange for a welcoming entry that invites guests into your home. When you have orange, it's going to draw your eye, so make sure you're using it in locations you want to be noticed. For a relaxing space, consider mixing apricot with deep browns and greys. If you love the feel of fall, bring the colours of leaves inside with orange, red, brown and gold accents. For those who crave energy and excitement, a combination of bright orange, pink and yellow citrus makes any room a party. Use tangerine and hot pink to energize a normally dark room. Use orange for the shelves and back of bookcases or cubicles to add depth. A powerful choice, it may also be a bit too stirring to inspire sleep. But lighten the tone and you have coral, a soothing shade of red-orange that evokes the serenity of the beach. Choose whatever colour you want for your space but make sure you follow the colour psychology. The guidelines discussed here in the two parts which includes–meaning, mood and principles of each colour will help you distribute the right colour hues in your space and make it look appealing. READ ABOUT THE PSYCHOLOGY OF COLOURS IN INTERIOR DECORATION - PART 1 HERE.